Broken Heart Jewel Knight, Ashlei "Яeverse"
[ACT](VC) Limit Break 4 (This ability is active if you have four or more damage):[Counter Blast (1) & Choose one of your rear-guards with "Jewel Knight" in its card name, and lockit] Choose up to one rear-guard in your opponent's front row, retire it, search your deck for up to one card with "Jewel Knight" in its card name, call it to (RC), and shuffle your deck. This ability cannot be used for the rest of that turn. 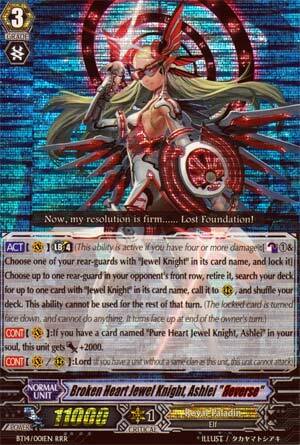 [CONT](VC):If you have a card named "Pure Heart Jewel Knight, Ashlei" in your soul, this unit gets [Power]+2000. ...if there's ever a definition of a near free +2, this is it. Ashlei's newfound power costs you a Counterblast and a Lock, but in exchange, you retire an opponent's rear-guard and Superior Call a Jewel Knight from your deck. Even with the Lock, you get a free unit of your choice AND get rid of an opponent's attacker! This effect is devastating in a Late Game scenario as most people are in a minimal hand size and normally can't afford to lose an attacker and Ashlei here just breaks your heart by breaking your field...all of the puns intended! Jewel Knights back then weren't the best subclan out there, but Ashlei helped give the shining warriors of Royal Paladins some much needed acknowledgement. Next Time: ummmmmmmm...I have nothing. R Broken Heart Jewel Knight, Ashlei "Reverse"
Final card of the week is a card I came to like, if only because she took a big fat dump on the point behind 3 Reverse units I can name. Ashlei Reverse, once per turn, locks a Jewel Knight and Counterblasts 1. You then retire an opponent's front row Rear-Guard and summon a new Jewel Knight from the deck. See what I mean? You have gone +1 up guaranteed just from using her skill once. Cocytus needed something like Sea Strolling Banshee to be +1 up, whereas Ashlei just laughs in its face. But that's not the worst thing about Ashlei. The worst part is that she has external support that could basically make this a +2. Security Jewel Knight Arwen can send an Ashlei in the Drop Zone to the bottom of the deck to give Ashlei 5k power, making up for the fact you locked her booster. Oh look, Iseult and Prizme are both things, so Ashleis can be dumped regularly enough! Ashlei "Reverse" is pretty awesome, even if she is a reminder of the desperate futility behind Venus, Luquier and Cocytus. Nanya Broken Heart Jewel Knight, Ashlei "Reverse"
Anyway, we're ending the week on a decently high note. This is the Cross Ride of Ashlei, which is the most vanilla of all the Break Rides in the game, so, on that turn, at least, you'd at least get +12000/+1 critical for the attack. The Limit Break skill... Well, it's actually pretty good, lock one of your Jewel Knight units, retire one of your opponent's front-line rear guards and then superior call a Jewel Knight. Kind of like Trap Muse Reverse, but better since there's no chance of you not getting what you want. Only downside is, the unit that gets called out doesn't get a free power up. But, considering that Royal Paladins are the clan that excels at superior calling and powering up, I don't think it's too much of a problem. Overall, a very solid card with a nice Limit Break that lets you thin your deck, retire one of your opponent's resources and fills your field without burning your hand up.